Bowmore is home to the World’s oldest Scotch maturation warehouse, the legendary No.1 VAULTS. Some of the world’s most coveted single malts have been meticulously matured here, steeped in more than 230 years of heritage, matured in the finest casks. 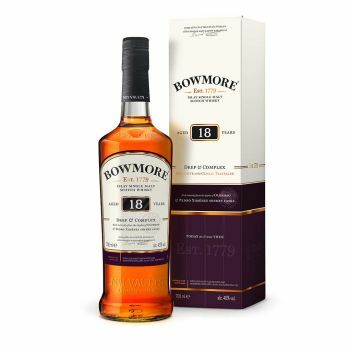 Bowmore’s 18 years old is perfectly balanced, with a dignified maturity through time well spent in the depths of the finest Oloroso and Pedro Ximénez Sherry casks. Let layers of rich chocolate, peat smoke, treacle toffee, dates, fruit oils and aromatic roasted coffee envelop your soul.